We should say "pre-mastering" instead of "Mastering", but everyone says "Mastering", so I'll do the same. Theoretically, the mastering is the process that results in a "Master", which is the final version of a recording before it's transfered to a physical medium (vinyl, cassette, CD, etc. ), while controlling that all established norms are respected for the type of medium. Therefore, it's the last creative process as well as the last purely technical process of a recording. But most of the time, when someone speaks about mastering, it's merely the last creative step of a musical work, the one that comes right after mixing and before broadcasting it to the public, whether that public be yourself and your family, or millions of people! - The mix must be completed. Don't start the mastering process unless you are happy with your mixing and there is nothing more to do in that area. Because mixing is the art of polishing each instrument individually to get a consistent whole, while mastering is the art of polishing a whole tune as a single entity. You don't deal with various parts anymore, you deal with the whole mix altogether. Which implies it must be finished. - In order to be objective once the mix is over, I advise you to wait one day or two before starting the mastering. As the hearing memory is rather short, you will rediscover your work with a fresh ear if you wait that long. - During the mastering process, it's better to work with studio monitors rather than with a headset, even more so than for the mix. But as always, it's better to work with a very good pair of headphones than with mediocre monitors. If you work with headphones, be aware that your perception of stereo sounds, as well as the balance of lows and highs are different with headphones. But if you know your headphones well, if you use reference songs that you know as well, you will be able to fix any possible mistakes by yourself. - In professional studios, the mastering engineer is not the same as the mixing engineer. That gives him a fresh and neutral look over the song. Mastering monitors are also particularly accurate and placed in a well-studied room, sound-wise. In a home studio, you will most probably mix and master yourself, with the same monitors and/or headphones (and not necessarily the best ones), in an untreated room of your appartment or house, with daily life sounds around you (cars in the street, noisy neighbors, family members in the next room...). And you're going to have to deal with it! - An equalizer. If your mix is good, you probably don't need to balance frequencies when mastering, but a few (very few!) corrections might be necessary here and there. - A reference song. To help you reach your goal, keep a song you like within reach (use a song in the same style as the song you're working on, don't refer to Mozart if you're mastering a Death Metal song...). Your aim will be to obtain a sound similar to that song. - Plugins that will let you know about the dynamics of the song, so you don't get a sound that is too compressed and crushed. Like TT Dynamic Range Meter available on this page. Personally, I only use a multiband compressor and a limiter. The first one helps me to highlight some frequency ranges to shape and enhance the sound. The difference with and without a multiband compressor is staggering. The limiter will boost the perceived sound volume and make the song more energetic. But don't overdo it or you might lose some dynamics and make your song too aggressive and tiring to listen to. To be clear, on the Master bus, the bus towards which all other main buses converge (guitars, bass, vocals, synths, drums), I put a multiband compressor plugin on top. A multiband compressor will apply different compression settings on frequency ranges defined by the user. For example, you may want to compress a lot the low frequencies, leave the mediums untouched, and slightly compresse the highs. 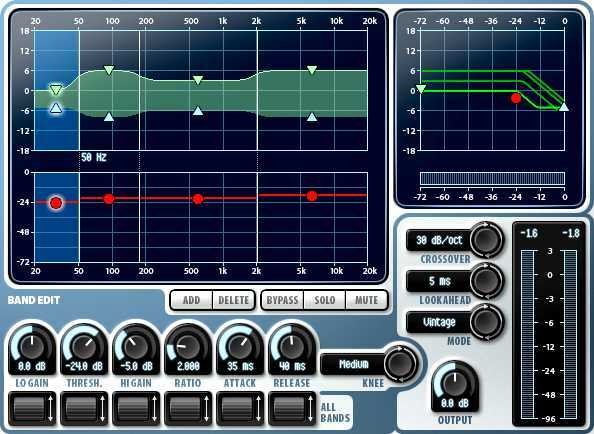 - Threshold: defines the level from which the compressor starts reacting. - Ratio: defines the compression level you want to apply, from 1 (no compression) to infinite (in this case, the compressor becomes a limiter). - Attack: defines the speed at which the compression reacts once the threshold is reached. 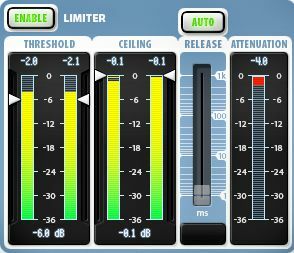 - Release: defines the speed at which the compressor stops reacting once the volume level goes back below the threshold. - Knee: defines whether the compression starts reacting precisely when the threshold is reached, or starts reacting gradually when the volume level comes close to the threshold. - Gain: the more the sound is compressed, the lower the volume gets. To compensate for the volume loss due to compression, use the gain. Multidynamics (the multiband compressor plugin that I use) has two gain knobs; lo-gain and hi-gain. Lo-gain is the gain that is applied to the sound signal when it is below the threshold, whereas hi-gain is the gain applied to the signal when it is above the threshold. The ratio determines the transition from one to the other. To use Multidynamics like a compressor, lo-gain must be higher than hi-gain, which will reduce the signal gain when it gets over the threshold. If you do the opposite (hi-gain higher than lo-gain), the compressor becomes an expander, that is to say the opposite of a compressor. For now, we are looking forward to using the plugin as a compressor and not as an expander. - Output: the overall output volume. - From 2 to 20 KHz, for highs. Obviously, the multiband compressor allows for a much better sound clarity and all instruments find their place. Everything seems to breathe better, the sound is less confined, more open. Just better! Wave Arts Multidynamics is a commercial plugin. You may replace it with a free alternative plugin like 5orcery from Platinum Ears Plugins, a free 5 band compressor. The zip file contains the PDF user manual, as well as a preset file named "5orcery_master.fxp". This is the preset I use for the song Life, and corresponds to the screenshot below. I obtained a very similar result using the free multiband compressor 5orcery from Platinum Ears Plugins. Simpler than multidynamics, it offers all the settings you need. You get 5 frequency bands, you can manually choose the frequency that separates two bands, and each band has threshold, fain, attack and release knobs. The peak detection is achieved by selecting an RMS level for each band (RMS is an average level, similar to what the human ear can perceive), or the peaks (Pk). You can also activate or deactivate each band separately if you don't want to use all of them. You can adjust the Input signal, and you will find a Saturation knob, which does not add saturation, but is made to attenuate unexpected peaks. Finally, you have an overall Output level knob. Using the settings shown on the screeshot above, I obtain a result pretty close to what I get with Multidynamics. It's a bit less accurate, a bit less defined, but it's definitely close. We are one step away from the final result, and we are going to use a limiter. This is a tool that will boost the volume of a song, by raising up the volume from a defined threshold, up to a ceiling level you define manually. This is a great tool, but it can be damaging to the song. If you set a threshold too low, the sound is altered, it can become very aggressive, because the sound dynamics is crushed and everything will sound loud all the time. So, be gentle with it. With modern music (such as Dance or many Electronic musics), you can compress the signal much more than you would with musics that should have more constrast, where volume variations are desired and benefit the song, making it lively. For the song Life, with the multiband compressor activated, the average RMS level is rather low, around -15 dB, with a dynamic range between -12 and -14 dB for the most part. This means we have quite a lot of margin, the dynamics is rather large, and we will be able to apply much compression without damaging the song, in order to raise the average level while maintaining good dynamics. In the top center, you can see the dynamic range at the moment the screenshot was made while playing the song (14.3 dB). At the bottom left and bottom right, you can see the average RMS level of the left and right channels (-16.3 dB and -15.6 dB). Once the limiter is activated, we still have a dynamic margin between 9 and 11 dB. For your information, the album Nevermind by Nirvana, released in 1991, had a dynamic range of about 12 dB, as well as the album Wish You Were Here by Pink Floyd, released in 1975. The Fame Monster from Lady Gaga, released in 2009 has a dynamic range of 5 dB. Way more compressed! The trend nowadays is to compress a lot, reducing the dynamic range as much as possible, which is bad for your ears and bad for musical finesse, but high compression levels allow for a high sound volume. It has been proved that a song is more attractive when played loudly, so record companies try to get the highest possible volume by compressing more and more. People are getting used to such high compression levels, they have become a standard and if you don't follow that trend, you may very well be looked down upon. Within a playlist, if the volume of a song is much lower than that of other songs, chances are the listener will just skip it, especially if they don't know it well and like it a lot. Yet, it would be so easy to simply raise the volume.. Here, the Wave Arts limiter FinalPlug is set with a threshold of -6 dB and a ceiling of -0.1 dB. This means that when the sound level reaches -6 dB, the signal will be boosted up to -0.1 dB. Release is set to Auto. As you can see, the RMS level goes from about -15 dB to about -9 dB, which corresponds to the 6 dB added with the limiter. As for the dynamics range, it is reduced by about 3 dB, but we maintain around 10 dB. Wave Arts FinalPlug is a commercial plugin. As an alternative, you may want to use the Classic Master Limiter from Kjaerhus. Classic Master Limiter from Kjaerhus is a good limiter, very simple to use as there is only one knob. The only setting is the threshold. There is no ceiling setting, but it is in fact predefined to -0.2 dB. The sound obtained is slightly different from Wave Arts limiter's, but the difference is not that huge. Voilà... this tutorial is over. Mastering was the last stage. Remember that this tutorial is not a magic formula that should be strictly followed all the time, with all songs of all genres. Mainly because it is not perfect, but also because there are many possible ways to mix a song to get various results. Finally, because each music, each song must be treated differently. Some plugins are useful for some songs and not for others, settings will need to change, etc. There are tons of other things to find out and learn, by yourself, with other people, through the Internet, this is a vast subject. Everyone has their habits, their hints and tips, but there's always more than one solution to a problem. Don't forget that the best way to improve your skills is to practice, again and again. So, experiment and have fun!! !